If you don’t know the WiFi devices around you or you work in a company where WiFi networks are used, it is important to be able to generate reports of the WiFi networks periodically. What information does a WiFi report provide? Generating periodic wifi reports, identified by date you can see the evolution of WiFi networks around and detect fraudulent WiFi networks that attempt to supplant our network and can incur a security breach. With Acrylic Wi-Fi Professional it is possible to generate reports of the WiFi networks in a very simple way as with the site survey wifi reports. These are high quality and detailed reports in HTML format with which you can generate quality documentation of nearby WiFi networks and complement your work with detailed reports. In addition, data from WiFi networks and clients can be exported to RAW/CSV format with which you can export access points to other tools as well as store in ASCII format the complete list of devices. Also, all these reports are easily editable, so you can edit and adapt to your needs, formats or corporate templates with minimal effort. How to generate a WiFi report ? 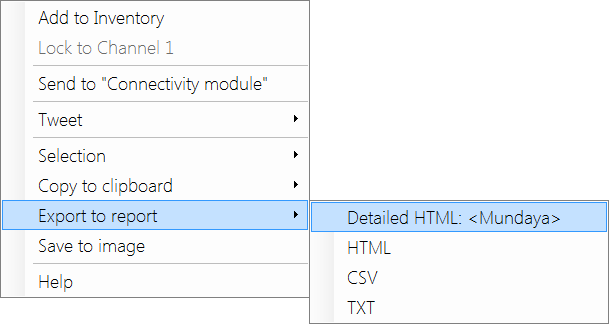 To generate reports during an analysis you simply need to access the report generation options through the right mouse button menu. This report is interesting because it only generates a document about the selected network and clients, is the best option to have weekly reports of your corporate network to check its status over time and verify that everything is correct.
. This list exports all detected access points as well as detected clients. If you want to generate a report on the current status of WiFi networks available this is the best option. format If you access the “Stations” view, you can export the complete list to an HTML file that allows you to edit it and include it in any deliverable. After exporting the results to CSV format, the results will be stored in a text file with CSV extension where the data of each row are separated by a TAB and is ready to be opened with EXCEL and that the data are organized in each cell. This format is useful if you want to export the results of the WiFi analysis for use with other tools or to perform another type of analysis. The report generated in TXT format represents the view of access points and list of devices in the format of a table generated by ASCII characters. It is an interesting option when you want to include the list with format in a document and you do not want to create tables to put each element. As we have seen, the information that can be obtained in a simple way helps to manage the assets and networks of our company or home as well as being able to verify that no one is supplanting our access points and routers with rogue aps and will have evidence at the time of the specific state of a network and be able to compare it over time. Inicio / Acrylic Wi-Fi Professional / WiFi Report. How to generate a report of wifi networks ?